Exterior stucco. 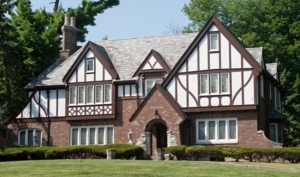 When I think of it, I think first of Tudor Revival or maybe Spanish Colonial (Cincinnati could be considered something of a “Tudor Town” but we have some Spanish Colonial homes too!). Stucco is more widespread here and elsewhere though.